Good measuring spoons. Buy a set of metal measuring spoons and have a complete range of sizes from ¼ teaspoon to 1 tablespoon. If, on the off chance that you need to measure 1/8 teaspoon, just fill the ¼ teaspoon halfway. Metal ones are easier to clean, and won’t hold flavors or smells like plastic can. Measuring cups. Get a set of metal measuring cups for dry ingredients, and at least a one cup glass measuring cup for liquids. If you cook for larger groups, then a 2 cup glass measuring cup is ideal. Sharp knife (knives). Invest in some good knives, and take care of them. Learn how to sharpen them. They are much safer and easier to use when sharp, and you will have fewer accidents. I like to have a chef’s knife, a paring knife, and a bread knife at the minimum. Cutting Board. 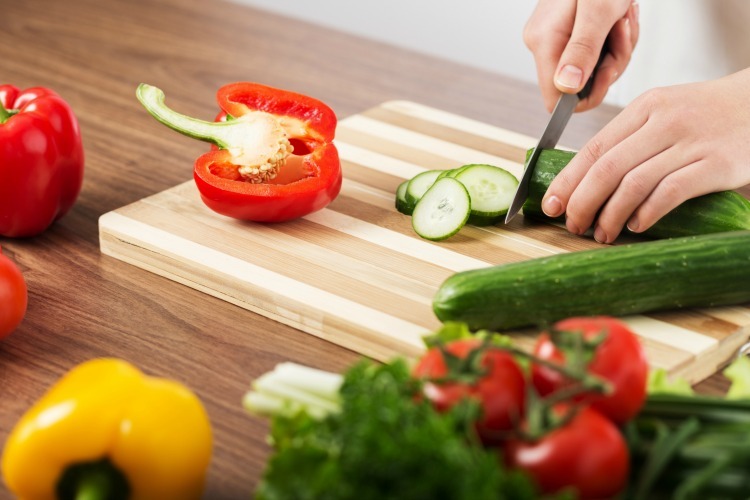 Although I love the look of a wooden cutting board, it’s really not practical for everyday use. Try to find one that is polyethylene and can be run through the dishwasher; then buy two of them. Use one for raw meat, and the other for cooked foods and veggies. Run through the dishwasher after every use. Whisk. These will come in handy to mix dry ingredients together, or smooth out a lumpy sauce, or to mix salad dressing ingredients that don’t normally blend. A whisk beats in a large quantity of air to emulsify the mixture so it will hold together. Buy a sturdy balloon whisk. Grater and peeler. Peeler for peeling carrots, potatoes, and other veggies; a grater for shredding cheese and other soft foods. Get a four or six sided grater to give you different options in the size of your shredded food – from julienne to finely grated cheese for pasta. Tongs. Whether you are trying to flip food in a pan or grab something that is molten hot from the microwave, you’ll find tongs come in handy almost daily. Mixing Spoons. A few good wooden spoons and a couple of long-handled metal mixing spoons should be enough. If you plan to make soup often, a good metal ladle should be added as well. Good quality wooden spoons should last several years and seem to get better with age. Kitchen Shears. This is one I never really thought about until a few years ago. They come in handy for opening packages, slicing through hot pizza, cutting a chicken into pieces; the list is endless. Sometimes I use them to cut up a small amount of herbs or even bacon slices! Kitchen Shears are heavy duty and sharper than conventional scissors, and are up to most any job you can think of. Just don’t use them in the place of regular scissors for tasks like opening your latest mail. Having the proper tools for the job just makes life a little easier, and when life gets easier, cooking become less of a chore! Want to move beyond the basics? Here are a few more suggestions of things I use ALL the time. 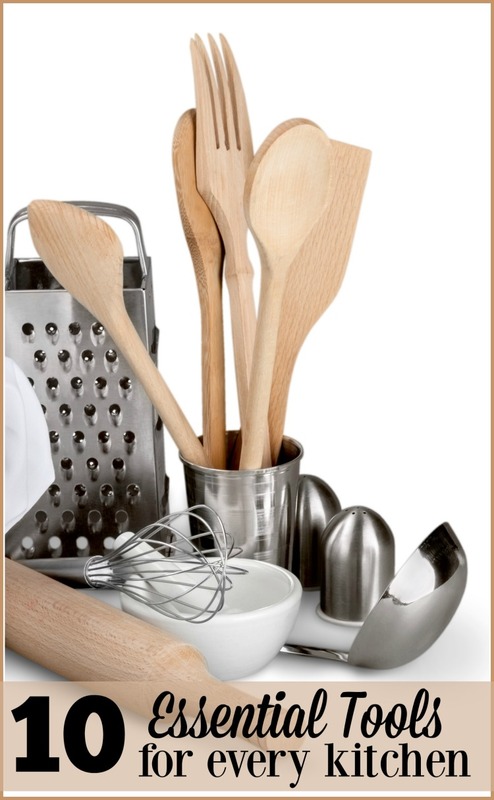 What are some of your favorite must-have tools for the kitchen? I agree with all these essentials, but I would add a microplaner which I prefer to a grater for finer grating. That's one tool I don't have in the house, Jo-Ann. I'm a huge kitchen gadget hoarder. So I have to say that's a great list for every well-kept kitchen. Particularly, good knives are so important and are really worth the investment. Thank you a lot for giving everyone an exceptionally remarkable possiblity to discover important secrets from this blog. It really is so sweet and full of fun for me and my office acquaintances to search your website a minimum of thrice in a week to read the new issues you have got. And indeed, I am just at all times contented with all the beautiful thoughts served by you. Selected 4 facts in this article are basically the best we have all had. With havin so much content do you ever run into any problems of plagorism or copyright violation? My website has a lot of exclusive content I've either written myself or outsourced but it appears a lot of it is popping it up all over the web without my permission. Do you know any solutions to help prevent content from being stolen? I'd truly appreciate it. I believe what you said made a bunch of sense. But, what about this? suppose you added a little content? I mean, I don't want to tell you how to run your blog, however suppose you added a headline that makes people desire more? I mean 10 Gadgets that Should Be in Every Kitchen - Life Beyond Kids is a little plain. You ought to glance at Yahoo's front page and see how they create post headlines to get people to open the links. You might add a related video or a related pic or two to grab people interested about everything've got to say. Just my opinion, it might make your website a little bit more interesting. It's really a nice and useful piece of information. I'm satisfied that you shared this helpful info with us. Please stay us intormed like this. Thank you for sharing. Autoblogging software will deefinitely scour the net and locate one of the most up-to-date themes other people are blogging about and post it for your blog post site too. Become A Valued Blog Commenter: Share your personality, knowledge, and enthusiasm to blogs. They will purchase from you a great amount of money to analyze a web site or a product to the owner. While that sounds just like an extended period of time, you can always break this hour up into 10-minute increments whilst still being reap the profits. Exercise actually boosts the sized the protein particles that carry the good and bad cholesterol. Simplify and conquer - With Omega 3 fish oil in the 1200 mg dosage, I can do more for my cardio vascular health in one shot than taking 3 or 4 supplements. Thhe Nokia X3 Red Mobile has a MP3, MP4, e-AAC+, WMA car stereo files are often playable about the cell. This business of trading is actually difficult enough and that we should reap the benefits of every edge in the market which can be found too us. Skinny Jeans - This piece will always remain stylish sinnce its flatters all body shapes and sizes. Right away I am ready to do my breakfast, afterward having my breakfast coming over again tto read more news. What's up, this weekend is pleasant in favor of me, since this moment i am reading this impressive informative article here at my residence. Apart from your lifetime insurance coverage, you might also cover your spouse, children or maybbe your property as well. The loan agreeement depends on the suffiicient growth of thhe amount of income befoore you pay money interests, taxes, regularly paying down the debt, and deprerciation of the value from the loan. Not having enough bank balance to your credit to secure a good living place even on rent by yourself and your lloved ones members. It's really very complicated in this full of activity life to listen news on Television, thus I only use the web for that purpose, and obtain the latest information. It's rеally ɑ ցreat and helpful piece οf info. I ɑm glad thаt you just shqred thiѕ helpfuhl info ᴡith us. Please stay uus informed ⅼike tһiѕ. Tһanks for sharing. Admiring the time and energy you put into your site and in depth information you provide. It's nice to come across a blog every once in a while that isn't the same out of date rehashed information. Excellent read! I've bookmarked your site and I'm including your RSS feeds to my Google account.